When it comes to investing in bitcoin and other cryptocurrencies, while Japan's "Mr Watanabe" retail investors may be the marginal traders "propping up the bitcoin market", no nation has as much of its population invested - literally and metaphorically - in cryptos. In fact, according to a recent study, more than 3 in 10 salaried workers in South Korea have invested in one or more cryptos. And the sole reason why bitcoin remains an unprecedented investment craze even as hackers have stolen millions, lawmakers are pushing for new taxes and regulations, and leading financial officials have called it a “Ponzi scheme" is that - so far at least - it has been the best investment for virtually anyone who has bought it: the S.Korean survey (which polled 941 people via email from Dec. 19 to 20, with about 80% of respondents in their 20s and 30s) revealed that of those who invested in cryptos, more than 80% made money from it, and about 20% made an average return of 425% on their investment. The average Korean investor owned some 5.66 million won ($5,260) in virtual currencies. One more thing: what happens in South Korean crypto trading, does not stay in South Korea: the country is the world’s third-largest market in bitcoin trading after Japan and the US, with roughly 2 million digital-currency investors by one estimate - one in every 25 citizens. The country is also home to one of the world’s biggest cryptocurrency trading exchanges, Bithumb. The country's crypto-trading craze is so pervasive that the country has developed the term “bitcoin zombie” referring to people who check the cryptocurrency’s price around the clock. Even the country’s prime minister Lee Nak-yeon expressed concerns over Korea’s bitcoin craze, warning that “young people and students are rushing into virtual currency trading to earn huge profits in just a short period of time,” and that “it is time for the government to take action as it could lead to serious pathological phenomena if left unchecked" forcing young people into illegal activities like drug dealing. For now, the "bitcoin zombies" are winning. As an example, as Reuters details in its just released deep dive in South Korea's crypto-community, on a recent weeknight at Sungkyunkwan University in Seoul, more than a dozen students crammed into a classroom not to study, but to share tips on investing in so-called cryptocurrencies, which have driven tales of fantastic returns for savvy investors. The group sat in rapt silence – broken only by a sudden shout of “there was just a big jump!” from someone monitoring his virtual currencies - as one student gave a presentation on how to read financial data and predict future trends. Make no mistake: it's a countrywide craze: “I no longer want to become a math teacher,” said 23-year-old Eoh Kyong-hoon, who founded the club, Cryptofactor. "I’ve studied this industry for more than 10 hours a day over months, and I became pretty sure that this is my future." At least until the industry crashes that is. For now however, driven in part by a dismal economic outlook – including an unemployment rate almost three times the national average - young South Koreans are flocking to virtual currencies despite the risks and warnings from officials. It’s a trend that has caught the eye of South Korean leaders and regulators, who announced new measures this week to regulate speculation in cryptocurrency trading within the country. Concerns about security and thefts of cryptocurrencies by hackers have also been rising. A South Korean cryptocurrency exchange recently shut down and filed for bankruptcy after being hacked for the second time this year. None of this matters to the grizzled 20-something traders: Eoh said the talk of more regulation had not dented his plans, especially after making what he said was a 20-fold gain on his investments over the past six months. He added that many students were bringing laptops to class to track the movements of their investments and participate in actual trading. “Even when professors are giving lectures right in front of them,” he said. Meanwhile, with Bitcoin soaring to record levels, younger investors have gravitated toward “altcoins” which often trade at much lower values, analysts say. Today's surge in Ripple is just one such example. Another is Iota, which traded at $0.82 in late November and now stands at $3.89, a gain of 375%. Energo gained 400% during the same period. “Since young people are more mobile-friendly, they can actually make more out of altcoin investments as long as they are able to discriminate gems from pebbles,” said Kim Jin-hwa, one of the leaders of the Korea Blockchain Industry Association, an association of 14 virtual currency exchanges. Obsessing over these get rich quick schemes, young investors say they don’t sleep until after 2 a.m., when there is a lull in the cryptocurrency markets as investors in places like South Korea and Japan log off. And so the zombies meet to strategize and plan what to do once they get rich: members of the club say they call each other to make important decisions together, and see information sharing as key to navigating the volatile cryptocurrency markets. “I literally knew nothing about cryptocurrencies or the economy,” said Lee Ji-woo, a 22-year-old sports industry major. “Everyone here has taught me a lot.” It’s now emboldened her to dream of a different future. “I can have two jobs maybe, one as an athlete and another as an investor,” she said. And if Lee did know about the economy, she would also know that despite the soaring price of cryptos and the local stock market, things are far worse than the traded securities would suggest. In fact, according to Reuters, tntense competition for jobs in South Korea is likely helping to drive interest in virtual currencies among young South Koreans, especially as they see others reaping big gains, said Shin Dong-hwa, head of the Korea Blockchain Exchange. “Whenever they go onto social network services, they are easily exposed to so many examples of young people around their age earning huge money,” he said. But some in South Korea’s financial establishment say those hopes may be unfounded. Kim Yong-beom, vice chairman of the Financial Services Commission, said Monday that the only reason prices were going up was because each investor expected the next buyer down the line to pay a higher price. “That really is a Ponzi scheme,” he said. Well, so are stocks, and unlike stocks, this particular ponzi scheme does not have central banks to bail it out as the end buyer when things go south. Others - that would be most - say students seem more focused on ways to get rich quick rather than on the underlying financial or technological values of digital currency. “There’s no way to measure their true value yet but students are just going for them, believing that they can earn a big fortune in just a snap,” said Yun Chang-hyun, economics professor at the University of Seoul. So far the student are clearly correct. 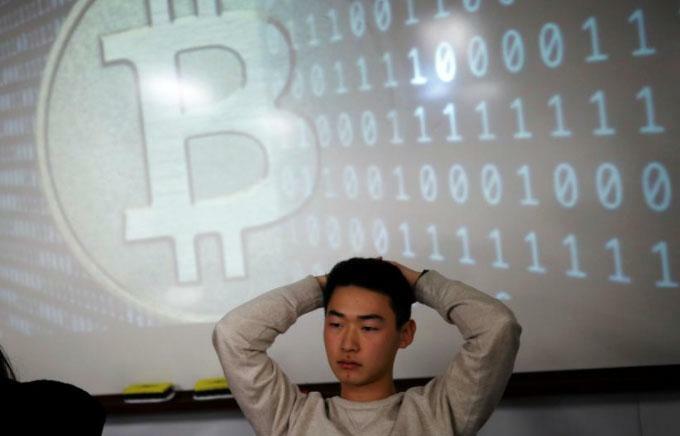 Going back to the Korean student "bitcoin zombie" collective, members of Cryptofactor say they founded the club because of a lack of dedicated cryptocurrency classes on campus and see their efforts as a way to move beyond speculation to informed investing. “I realized that I was actually speculating rather than investing before I came to this club,” said Kim Myung-jae, a 19-year-old fine arts student, adding that she was especially attracted to altcoins. "Now that I fully discuss which one to invest in with the members, I‘m actually looking at the true value." And with 19-year-old traders like Kim opining on the "true value" of cryptos, one can be pretty certain how it all ends. The only question is when.